By the early 1960’s, the Market we know today had seen better days. Seattle’s mayor called it a “somnolent fire trap.” Downtown business leaders and property developers were eager to use federal urban renewal fund to “renew” the Market by demolishing it. City Councilmember Wing Luke wrote a newspaper op-ed, calling for citizen action to preserve the Market. Architect Victor Steinbrueck and attorney Robert Ashley answered the call. In September 1964, they brought together sixty friends for a champagne breakfast to launch the effort in Lowell’s Café (still in the Market). Architect Fred Bassetti, unable to attend, wrote that the Market was “an honest place in a phony time.” With this beginning, the enthused advocates obtained a small office space behind Deluxe Bar-B-Q (still in the Market). With a telephone line and a typewriter, Elizabeth Tanner, volunteer executive secretary and manager, began a 30-year career of service to the cause. Wing Luke’s Seattle Times editorial laid out arguments Friends of the Market would use to rally support for their cause. Instead of full scale demolition and rebuilding, the Market should be allowed to preserve and repair, which was allowed in the federal Urban Renewal law. The recent historical preservation of Pioneer Square was cited as a successful model for how the Market could be restored. During the next seven years, Friends would present its case to the city in newspaper opinion pieces, posters, handbills, and street demonstrations. Money was always short for traditional campaign expenses, so imagination, street theater, and attention-gaining newsworthy events were devised. On one such occasion, in May of 1969, Victor Steinbrueck led a march of hundreds, each carrying a single daffodil (a symbol of the Market) to city hall for Mayor Dorm Braman and the city council. Later that year, before a crucial city council vote to advance the council’s “raze and rebuild” plan, Friends again went to the streets to get petitions signed opposing the city’s plan. They gathered 53,000 signatures, more than 10% of Seattle’s voting citizens. Since the petitions were not an official initiative, Steinbrueck recalled what happened next: “It was politely accepted and unanimously ignored” by the city council. After five years of active opposition to the city’s plan to raze the Market, the Friends were no closer to their goal of renovation and renewal. Steinbrueck wrote and designed a broadsheet modeled after Revolutionary War screeds calling out local “merchants of greed” who would profit from the Market’s destruction. This document “Last Chance to Save the Market” was widely circulated in the city to encourage public testimony and endorsement. It ended with the memorable line: Let us be resolved to keep this market that each generation may discover it anew. That last chance public appeal was dealt with by “Seattle Process.” The city council, by its own rules, had to hold public hearings on its final city plan, called Scheme 23. Friends used this public and open forum to create a long-running exposition of its views over ten days between March and April, 1969. Victor gathered Friends, citizens and experts to testify, stage directing their appearances for maximum effect and continuity of argument. Alice Shorett wrote, “Twelve sessions were held on ten separate days, thirty-three hours and thirty minutes of testimony were recorded and eight documents were submitted.” But the Council voted unanimously, again, to reject the Friends’ alternative plans. Audio recordings of those hearings are now in the Municipal Archives of the Seattle City Clerk’s office. When all else failed, and the federal government was preparing to release funds for the initial destruction of the Market, a federal change of policy in the Nixon administration created a delay that proved crucial. In the fall of 1970, Steinbrueck and local attorney Larry Shafer devised another legal delaying tactic, an equity suit in mandamus, challenging a state official’s arbitrary alteration of the size of the proposed nationally-registered historical district from 17 acres to 1.7 acres. This suit stopped the city from proceeding and delayed the flow of federal money. Taking advantage of the delay, Friends mounted another signature-gathering campaign in March, 1971, this time for a people’s initiative to create a seven-acre city historical district with a twelve-person citizen commission to oversee management and uses of the Market. In three weeks, Friends had gathered 25,000 signatures, enough for the ballot qualification. The city council was forced by law to put the initiative at the top of the November general election ballot. The “Keep the Market” campaign in the summer and fall of 1971 was the big news story in the city. Friends of the Market was joined by a new group, the Alliance for a Living Market, which wanted to contribute its political expertise to see that the initiative passed. City government, the two daily newspapers, the downtown Central Association, and several Market merchants were vocal opponents. The four local TV stations covered the initiative campaign as a political event. Both KOMO-TV and KIRO-TV took extended, but neutral, positions on the issues raised by the initiative. The election in the fall was the culmination of seven years of struggle and challenge for the Friends of the Market. The happy result was a strong outpouring of support for the preservation of the Market. Initiative No.1 had 129,633 votes cast: Yes votes 76,369, No votes 53,264 (59% to 41%). The initiative became a city ordinance and new Mayor Wes Uhlman appointed the first Market Historical Commission in December. Among the first twelve members were Victor Steinbrueck and John Bagdade, representing Friends of the Market. Under Commission Chair Irving Clark, Jr.’s leadership, the commission worked diligently to draft and approve the Market operating guidelines. Those guidelines remain substantially the same to the present day. Shirley Collins, a long-time active Friend of the Market, applied for and received the first Certificate of Acceptance from the new Historical Commission for her new kitchen store, Sur la Table, to be located in the space vacated by St. Vincent de Paul Thrift Store in the Garden Center Building. Over the years her business grew and became very successful. Eventually, it was purchased but continues to remain in its original location. By 2014, it had become a national chain with 117 stores. 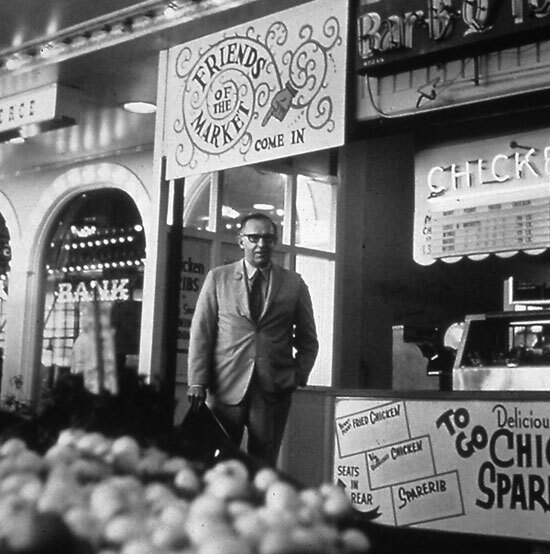 In 1973, the newly created Pike Place Market Preservation and Development Authority (PDA) was mandated by the state to manage the Market in the public’s interest. Friends of the Market later became incorporated as a state non-profit corporation and continues to supply the Historical Commission with engaged and well-qualified members. Mortgages taken out by the Market PDA in the late ‘70’s and early ‘80’s under a federal historic tax benefit program proved to hold hidden danger. The borrowed funds were needed to complete the restoration of the Market’s infrastructure. However, the tax law changed in 1986 and the mortgagors began to claim ownership rights. The previously invisible New York investors – the Urban Group – were trying to take over the Market. Resistance by the PDA led to what became known as the Urban Group crisis. Victor’s son, Peter Steinbrueck, organized a coalition of organizations and volunteers to fight THe Urban Group (acronym THUG proved useful). Friends of the Market was an early and active member of the Citizens Alliance to Keep the Pike Place Market Public. The struggle was fought mostly in the courts and finally resolved in 1992. The Market was saved once again and a new more fiscally restrictive PDA Charter created. In 1996, Friends of the Market took part in Market events to celebrate the 25th Anniversary of the passing of the Keep the Market Initiative. In addition to ceremonies at the Market, exhibits were mounted in the Seattle Central Public Library and the Special Collections of the University of Washington Library, which has collected Friends of the Market archival material for five decades. The Market’s Centennial in 2007 was celebrated by Friends of the Market with a special lecture series in the Seattle Central Public Library. Three lectures on the history and importance of the Market in Seattle were given by Paul Dorpat, Alice Shorett, and Roger Sale. The University of Washington Library, Special Collections, again mounted an impressive exhibit of its Pike Place Market document collection. In 2008, Friends was back in a political action role supporting the $73 million dollar six-year Levy for Capital Improvements, Renovation and Seismic Upgrades, which passed in the fall election. For the second time, Seattle citizens overwhelmingly demonstrated their affection and support for the Market on the ballot. In 2013, the Friends monitoring and advocacy took place in public meetings for the new Waterfront entrance to the Market. The planned removal of the Alaskan Way Viaduct and development of Seattle’s Central Waterfront provides a unique opportunity for the Pike Place Market PDA to reclaim an underutilized parcel of land within the Historic District and create a dynamic connection between downtown and the new Seattle Waterfront. This new project will develop a .75 acre site on Western Avenue long used as a surface parking lot. The planned low-rise, mixed-use development will provide parking for both the Market and Waterfront, added retail and restaurant space, and several stories of low-income and workforce housing as well as expanded facilities for the Market’s social service agencies. The redevelopment will also provide additional public open space and expansive views of Puget Sound while connecting the Market to the Waterfront with easy pedestrian access. It’s satisfying to know that the Market continues to grow and thrive. In its early days, thousands of citizens spoke up and acted to keep the Market. That same spirit of ownership and affection reverberates today in the Friends of the Market and the many thousands who cherish this very special public place. Victor Steinbrueck in front of the FOM office at Pike Place Market. mostly foreign born and fiercely independent. It provides an income for dozens of small businessmen and women of a breed embodying all the virtues, now almost gone, that we believe made American great."